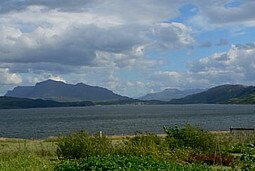 www.seasidecroft.co.uk Lochside holiday cottage near Poolewe in Wester Ross - comfortable and well equipped with lovely views. 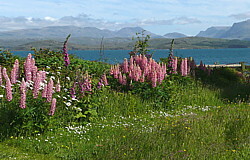 We have a wonderful location on the seashore with panoramic views across the water to the hills of the Great Wilderness. 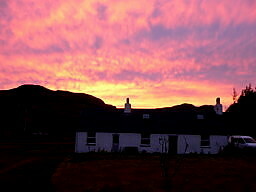 The croft land is five acres, we have begun a garden round the house and planted a vegetable plot, trees and hedges. Inspiration comes from the Inverewe Gardens in Poolewe at the head of the loch and we often visit Lechmelm Garden (on the way to Ullapool) and Attadale near Loch Carron. 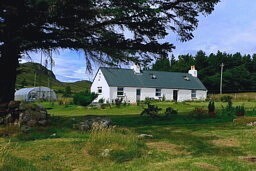 The cottage is ideally situated for exploring Wester Ross, which has wonderful beaches (Firemore is 5 minutes away), dramatic coastal scenery, wooded slopes, National Trust land and the Beinne Eighe Nature Reserve. 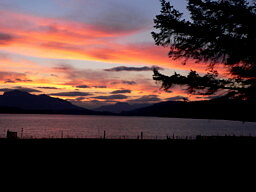 The Applecross Peninsula, Ullapool and even Inverness - the capital of the Highlands - are great days out. There is a wide variety of walking and, for the adventurous, the mountains of Torridon, Slioch and An Teallach. Poolewe and Gairloch have a range of facillities - places to eat, craft shops and galleries, museum, heritage trails, swimming pool, pony trekking, golf, fishing, whale and dolphin cruises - but the area still remains uncrowded and peaceful.